It’s always such fun to plan a ladies tea party. I find that it’s so much easier if you select a theme. Since I had decorated my house for Valentine’s Day with touches of Jane Austen a Regency Era Valentine Tea party seemed perfect. …or one that was completely elaborate. I aimed for something in between. Generally, flowers or plants were present in both settings. I wanted a bouquet that appeared to have just been collected from the garden. It featured tulips, roses and eucalyptus leaves for greenery. The first tea cups were actually tea bowls. There were many china patterns available. Did you notice the transferware pattern in the lower left-hand column? For that reason, I chose to use my antique red transferware for the tea party. Tea at the time came in the form of a loose leaf as tea bags were not invented until the early 1900’s. The tea was stored in tea caddies. They came in a wide variety of styles and materials, ranging from carved wood to enamel and even gold. Almost all the caddies featured a locking mechanism. Tea was very expensive during this era as it had to be imported from the Indies and China at great cost. I too served a loose leaf tea making a silver strainer necessary when pouring. There is also the decision to have a high or low tea. High tea (aka meat tea) is generally served between the hours of 5 and 7 pm and is more of a full meal. It may include meats, fish, eggs, and cheese, as well as bread and butter. I selected a low tea (afternoon tea) in which sweets were the predominant food. Desserts in the Regency Era could be quite elaborate and spectacular. Layered cakes were quite the fashion. As were biscuits (cookies) and tartlets. An overwhelmingly popular dessert was trifle. I’ll share this easy recipe on Friday. Over on the sideboard a gentle nod to a simpler, electricty free, time was created by displaying Mr. Decor’s antique cranberry glass candle holders once used by his Aunt Mildred. You may have also noticed a second teapot. It was filled with hot water. A good Regency hostess would always ask a guest if they preferred a strong or weak tea. If a weak tea was desired the cup was filled halfway with tea and the remainder topped off with a bit of water. It was also not uncommon for a hostess to send her guests home with a small favor such as a handkerchief, book of poetry, a few flowers or chocolates. This token would ensure that a hostess, and her generosity, would long be remembered. Particularly if refined sugar had been served. Alas sugar cubes were not invented until 1843 but since I was unable to find their predecessor, a cone of sugar, they had to suffice. I shared the favors I created HERE. If this post leaves you with a desire to host your own Regency Era tea I found some sweet images that could be transformed into invitations and such. I love the idea of creating a non traditional centerpiece perhaps containing a collection of Jane Austen books. Wouldn’t these repurposed pieces of china also look lovely on a Regency themed table? 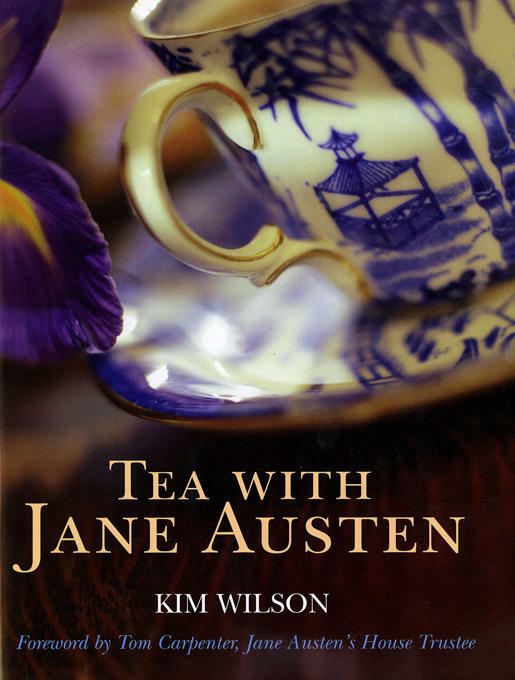 You may also enjoy “Tea With Jane Austen” which gives detailed information on recipes, customs and more. Perfection. Everything is so pretty and you have included so much detail and information. Love it all. So beautiful Laura! You are the most gracious hostess with the most fabulous tablescapes! And you know how I feel about Jane. sigh. This post is the most beautiful Valentine post I have read or should I say looked at the picture? Having an invite to a tea that beautiful would make me feel really special. It's gorgeous, Laura. Thank you for sharing your trip to Panama. I learned so much and the churches and animals were wonderful. The Tablescape, floral arrangement and the desserts look lovely. I've seen the book Tea With Jane Austen, but haven't read it yet. I might take a trip to the library. Oh Laura, this is a beautiful and informative post. I always seem to learn something from your posts. 🙂 You've put together a lovely Regency Era tea, and your guests will be very lucky to partake of these goodies. May I ask the name of your beautiful transferware pattern? It's not one I'm familiar with, but I love it! Thanks for sharing with us, Laura, and have a great week! I collected the transferware piece by piece while living in Germany. There are several patterns. Many of the antique pieces do not have a mark. I believe it works together because it is the same color palette. Laura, every detail speaks of your graciousness. This is a delightful post full of beauty and information. Thank you for sharing this. I loved this post! I really liked the old pictures of the fancy foods eaten back in the day! I think I would prefer low tea to high tea- simply because there are more desserts involved! Thank you for sharing with us all. I actually just found your blog – going to follow you on bloglovin! What a lovely post!! Love your red Transfer ware dishes! I collect them too!! Thanks so much for sharing!! This is a lovely table. I wish I were there to have tea with you! Wonderful post, Laura! Thansks for sharing all this! Wonderful Laura…we share the same thoughts…I used the same book a week ago and Jane Austen quotes…your table setting is perfect! I just love this post! What a lovely post! Kiki Nakita recommended I stop by to have a look and mentioned this post in particular to me! I own a copy of “Tea with Jane Austen”. Isn't it a fabulous book! I adore Regency era novels and am hoping to get to Bath to the Jane Austen Centre to take tea at the Regency Room. Look forward to more of your posts! I thoroughly enjoyed your beautiful post. It was not only lovely eye candy, it was very informative. Thank you! Well that was lots of fun! Well done Laura! Featured today at HSH! Laura! Laura, your tea post is gorgeous! I adore red transferware and tea; especially loose leaf tea! Everything is lovely and I enjoyed this post very much. Thanks for sharing and have a Happy Valentine's Day weekend! I love that red transferware as it is so perfect for Valentines and Christmas, not to mention – all the time! This is a lovely posting!